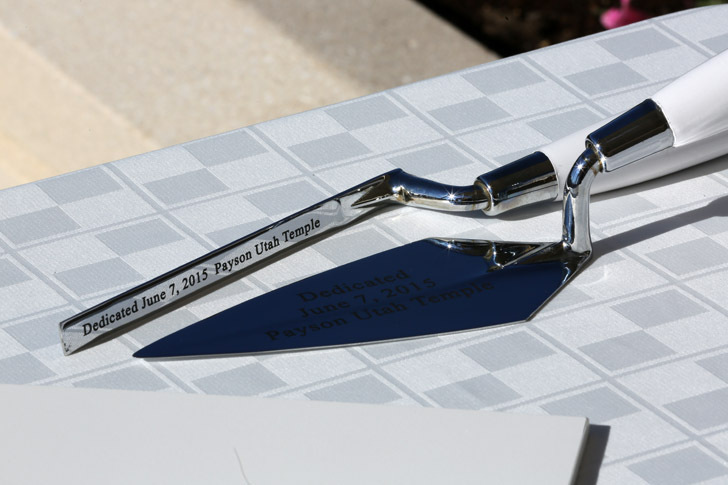 The dedication of the Payson Utah Temple Sunday, June 7, 2015, brought the number of temples in the The Church of Jesus Christ of Latter-day Saints to 146 with many more in various stages of construction. 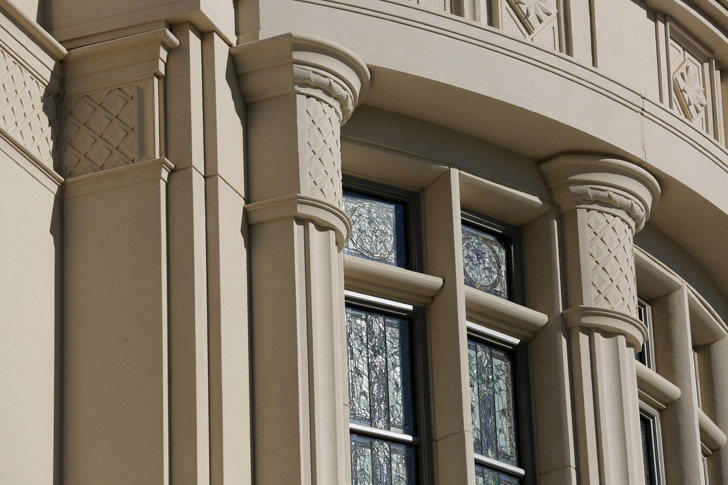 To put this in perspective, it took the LDS Church 167 years to build the first 50 temples with the St. Louis Missouri Temple being number 50, dedicated June 1, 1997–and then it took only another 40 months to build the second 50! We are in an era like none other in the history of the world. 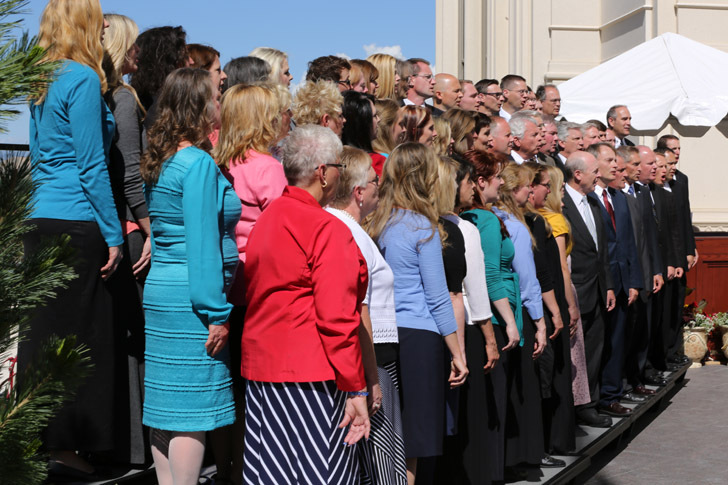 As Latter-day Saints living in this time, we have a front-row seat ahead of the billions of people who have lived on the earth before us in this great age of temple building. Our challenge is to awake and understand the power that is being placed in our midst. 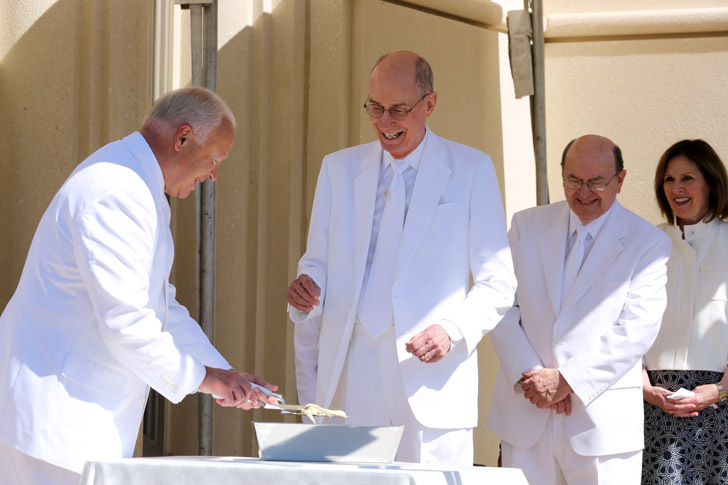 That power was evident at the Payson Utah Temple dedication where President Henry B. Eyring, first counselor in The First Presidency presided. 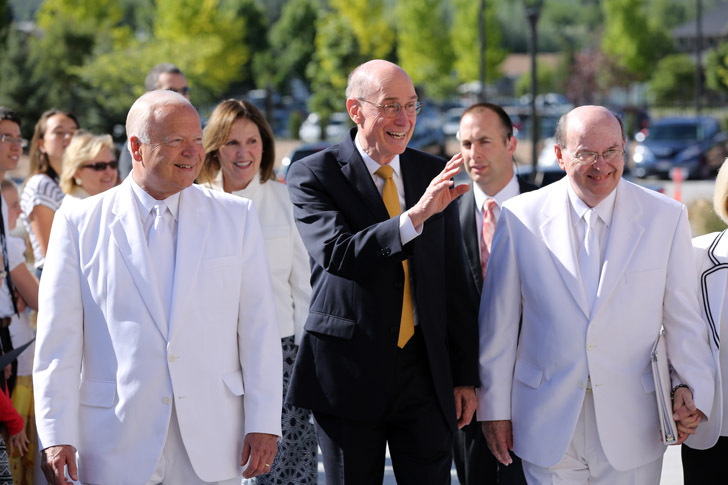 Joining him were members of the Quorum of the Twelve Apostles, Elders Russell M. Nelson, Dallin H. Oaks and Quentin L. Cook. 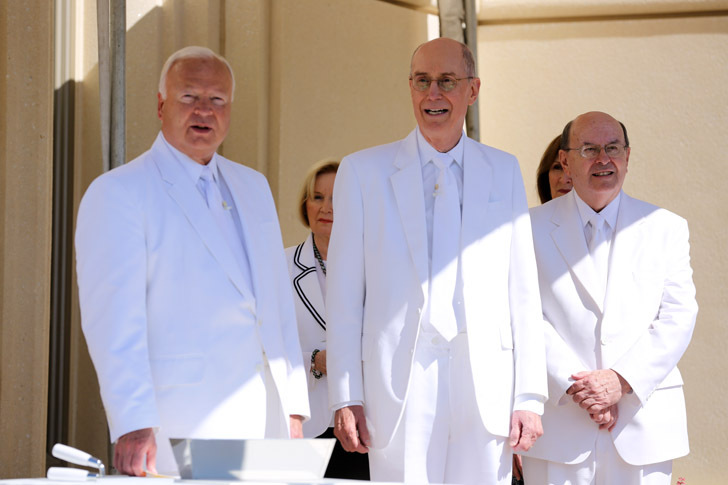 Other Church leaders included Elders Ronald A. Rasband and Ulisses Soares of the Presidency of the Seventy, Elder Kent F. Richards, a member of the Seventy and executive director of the Temple Department, Bishop Gerald Causse of the Presiding Bishopric and Carol F. McConkie, first counselor in the Yong Women General Presidency. 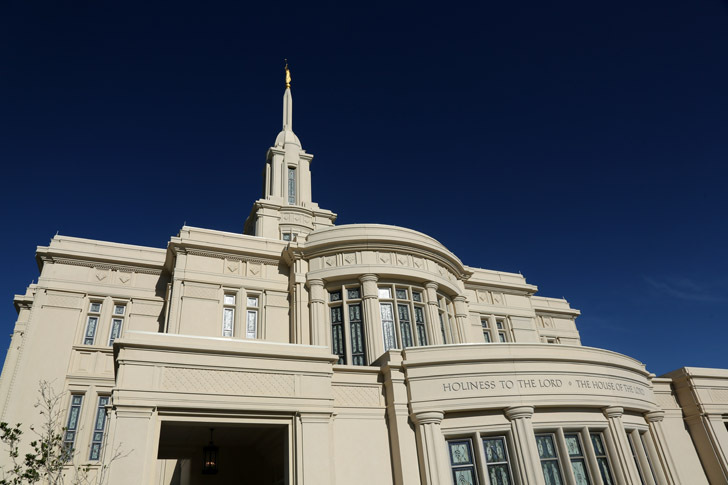 The temple, which is the largest that the LDS Church has built in some time, is encircled with mountain views and becomes part of a community with a pioneer past. The dedication was held in three sessions, but families, including, children dressed like angels, came early for the cover stone ceremony. Come and be a part of the event in this photo essay. 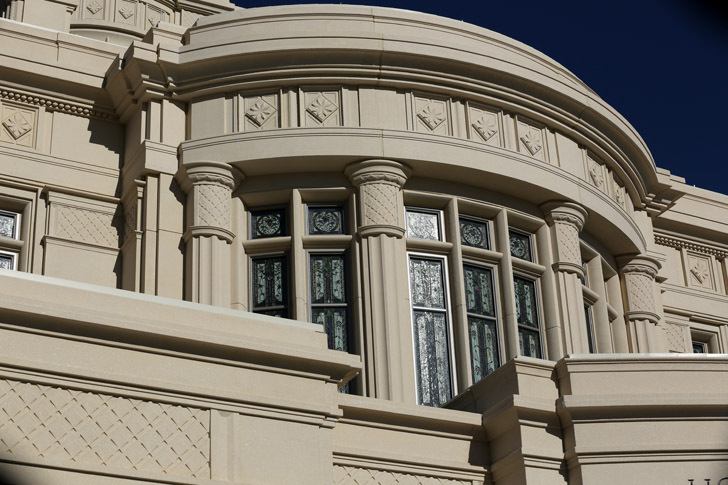 Light streams into the Payson Utah temple through these art glass windows based on a theme of apple blossoms because there are so many orchards in the area. After a storm the night before that nearly canceled the youth cultural celebration, the sky was untouched by clouds. People start lining up early on the day of a temple dedication and all eyes look up. 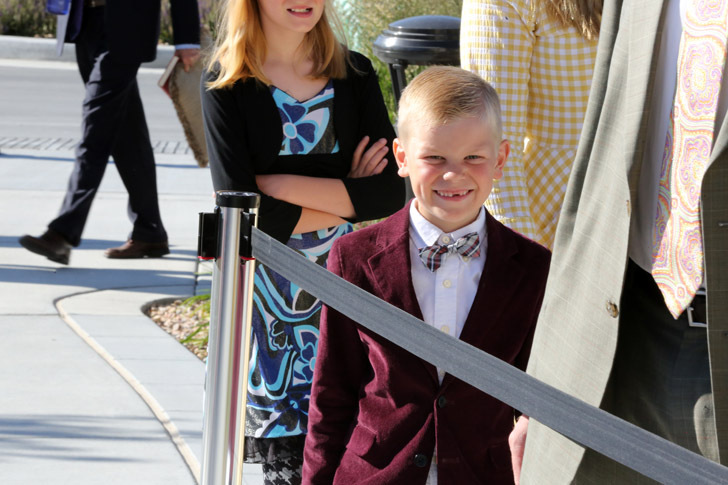 The crowd at a temple dedication always includes many children, whose parents want them to remember this event forever. 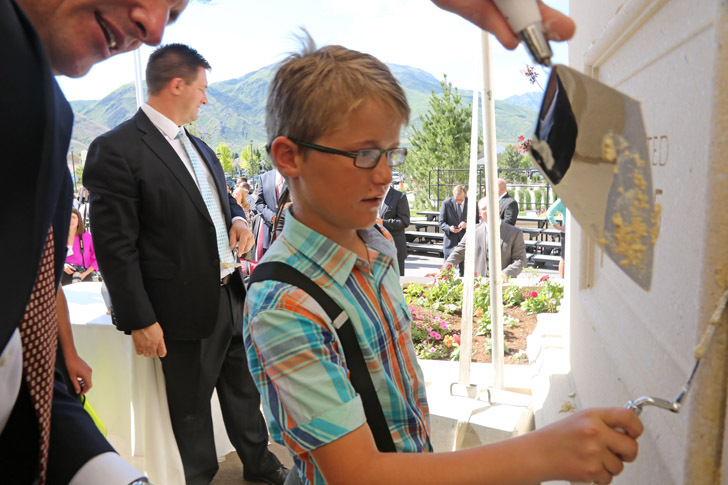 Because of the temple dedication, this boy was able to see prophets and apostles in a way he’ll never forget. 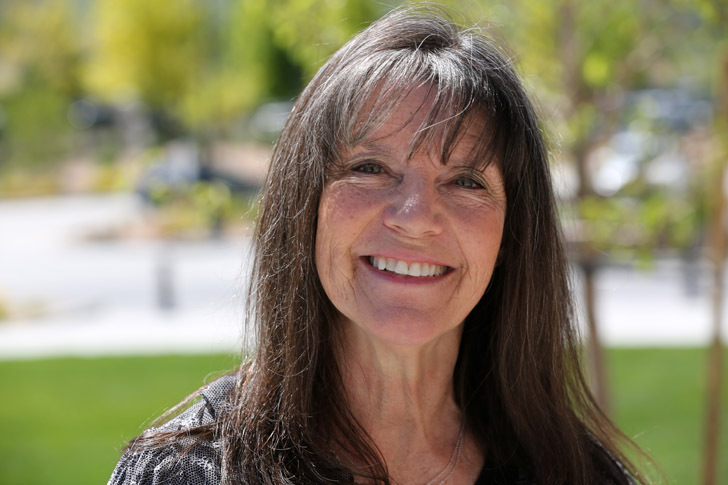 She will not only have a picture of the temple in her home. 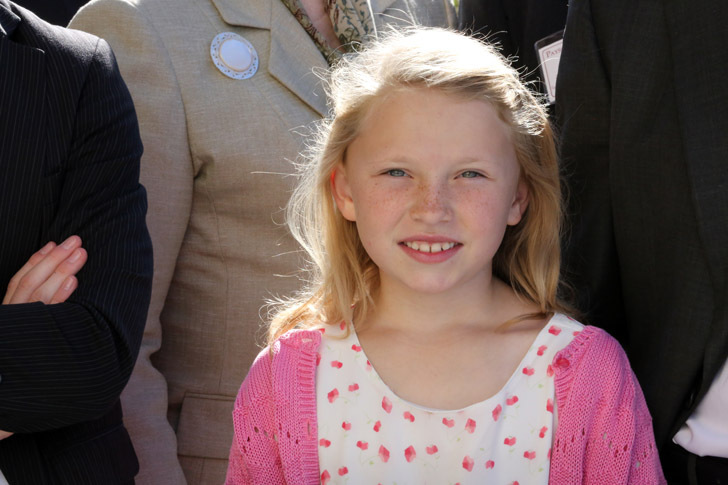 Now she will carry a picture in her heart because she was there on the day of dedication. The cover stone ceremony is held about 15 minutes after the first dedicatory session begins. 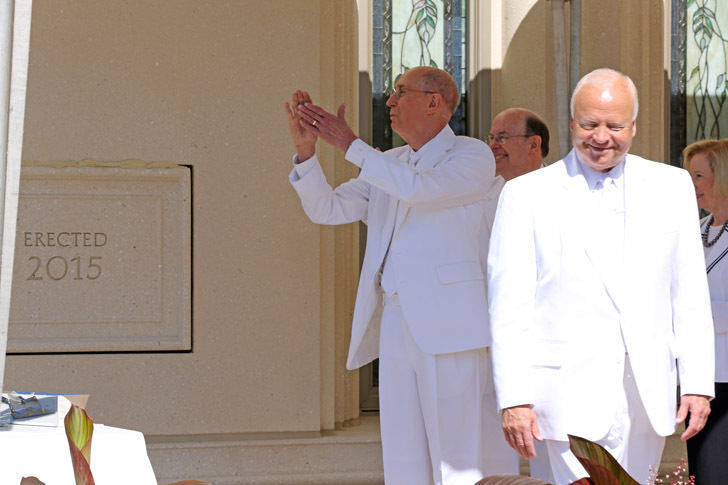 Elder Richards and President Eyring emerge from the temple for the ceremony and greet the crowd. 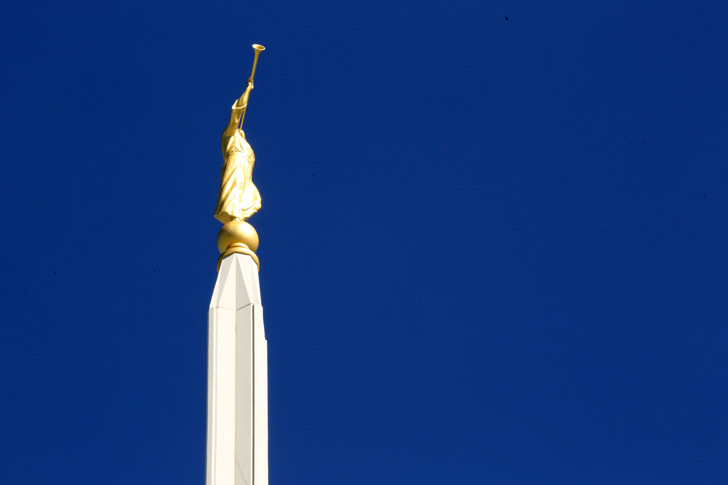 Elder Richards reminded the audience that this was the symbolic finishing of the temple to place a cover stone on the southeast corner [which is the point of highest light.] He reminded listeners that just as Christ is the foundation stone of the temple, so should he be of our lives. They picked up the trowel and a bit of mortar fell on the table. 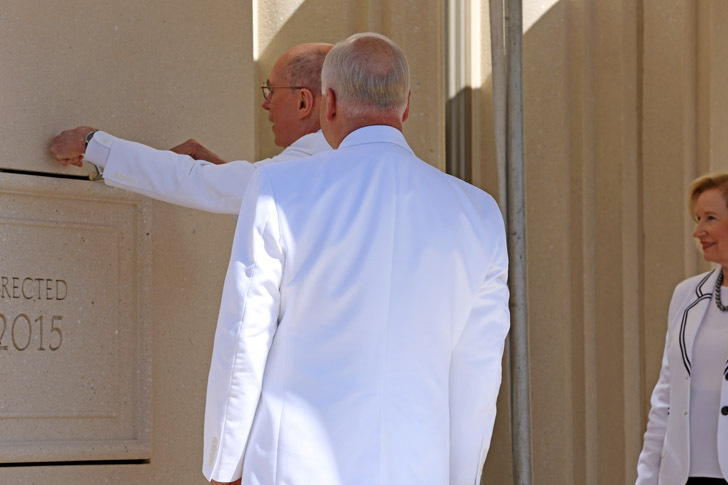 President Eyring smiled, “That always happens.” This mortar is not easy to work with. 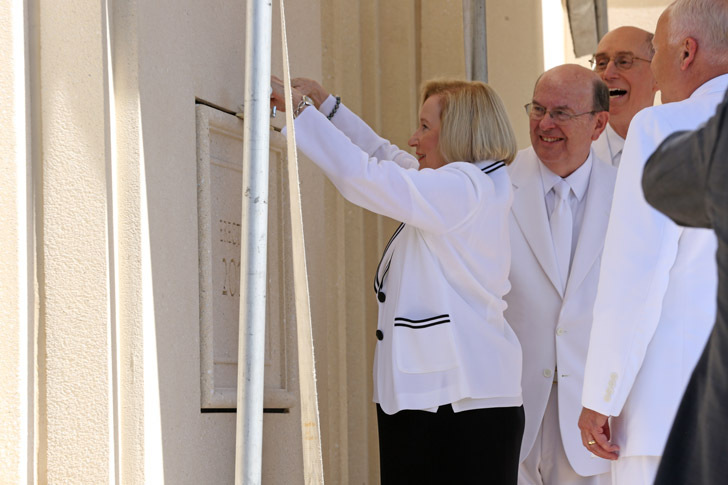 A box had been placed behind the cover stone earlier containing important materials such as the scriptures, a hymnbook, the dedicatory prayer, and some writings of President Thomas S. Monson. Mary Cook, wife of Elder Quentin L. Cook tries her hand with the difficult mortar. 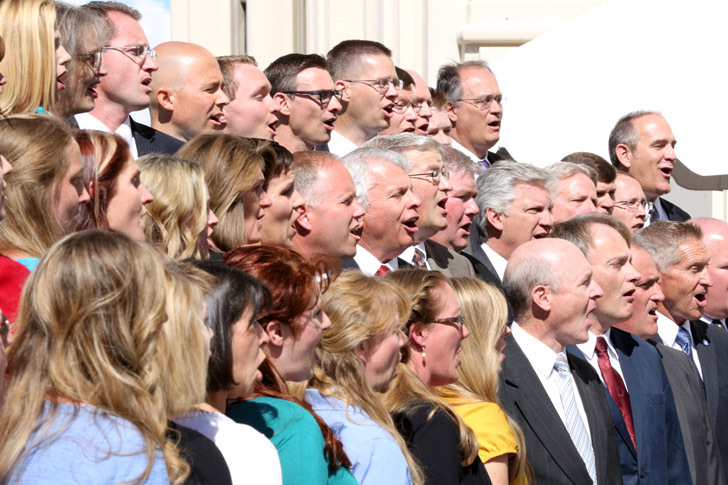 President Eyring encouraged the choir and told them how wonderfully they had done. 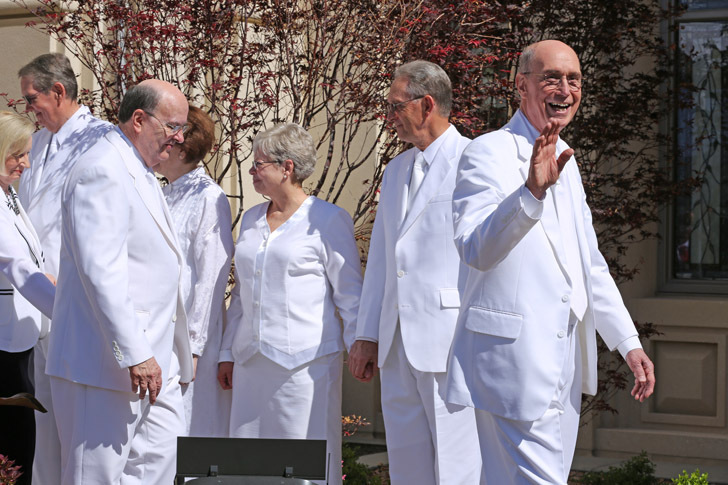 President Eyring continued to wave at people in the audience with his characteristic bright smile. 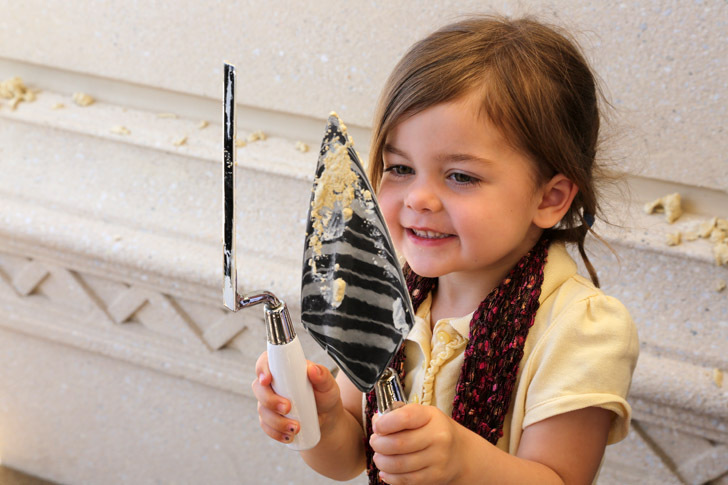 Even the youngest children get the chance to put a little mud in the crack and play a part in finishing the temple. This boy takes the opportunity very seriously. 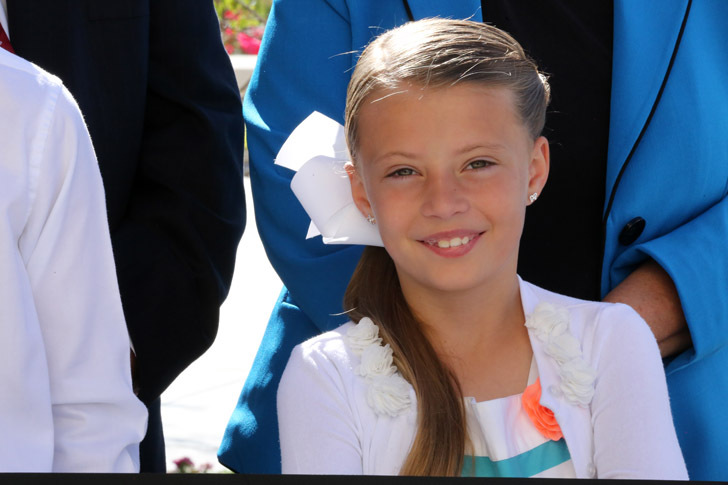 Maggie Abbott, 9, was dressed all in white and looked like was already dressed to go to the temple some day. 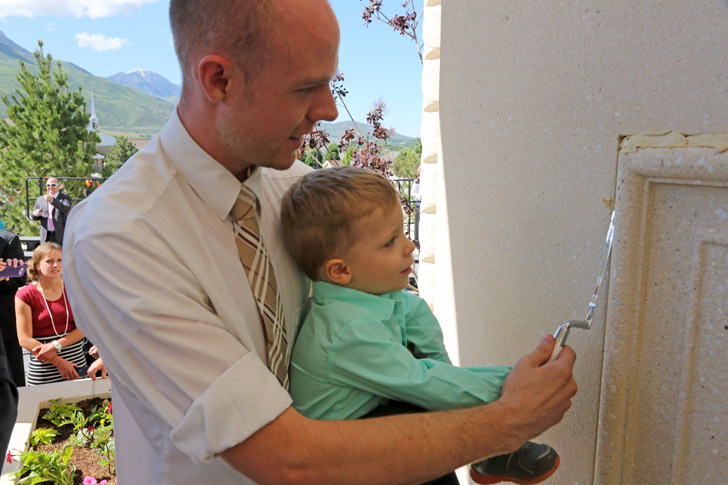 Morgan Abbott, 15, plans to tell her children and her grandchildren that she helped put the mortar in the cover stone of the Payson Utah Temple. 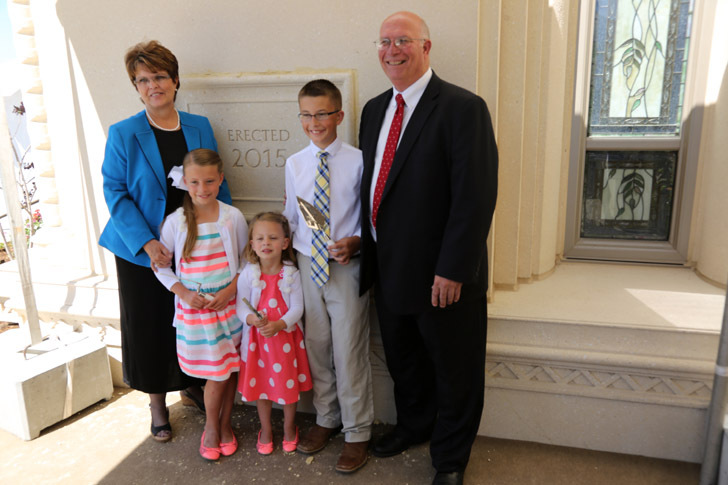 The Heather and Nelson Abbott family has made this temple a part of their life starting with the ground-breaking ceremony. 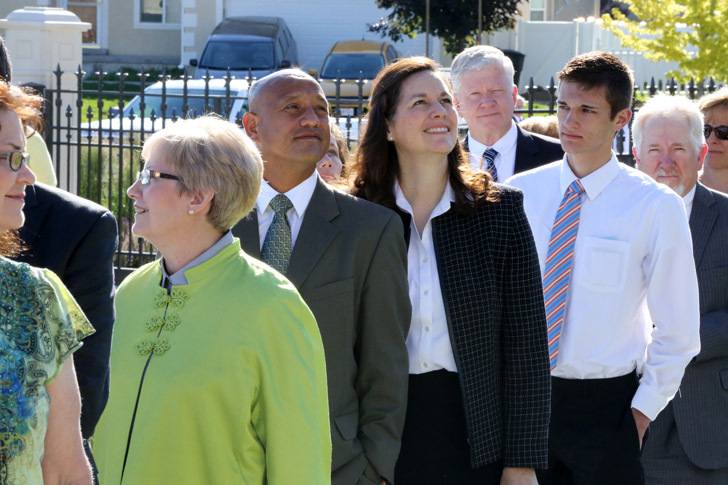 Some of them participated in quarterly temple walks, walking the 6. 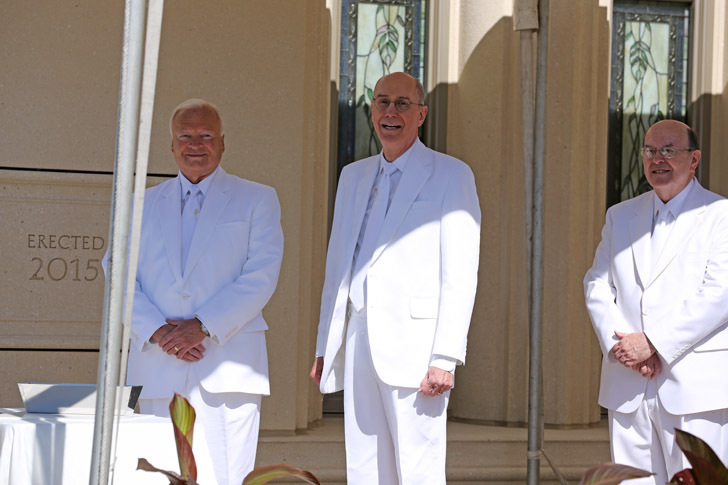 7 miles from their stake center to the temple while it was being constructed. 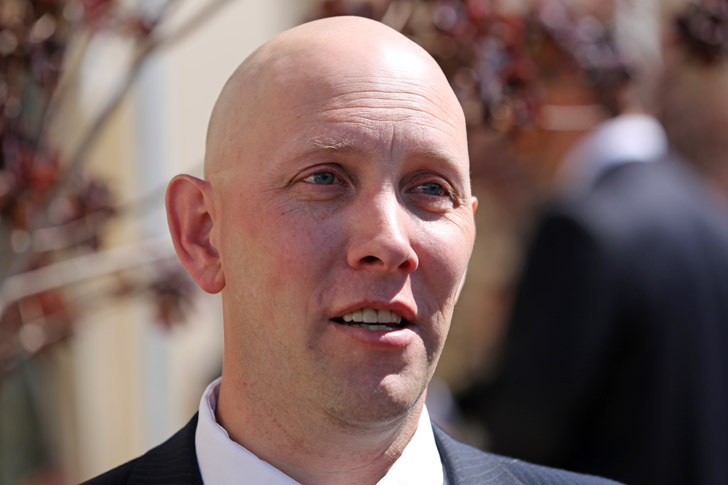 Nelson Abbott said that when he was young he used to ride his BMX bike on this property, which then was a turf farm and a bunch of gravel hills. He never dreamed that one day it would be a temple. Mike Abbott still waits in line for his turn to help with the cover stone. 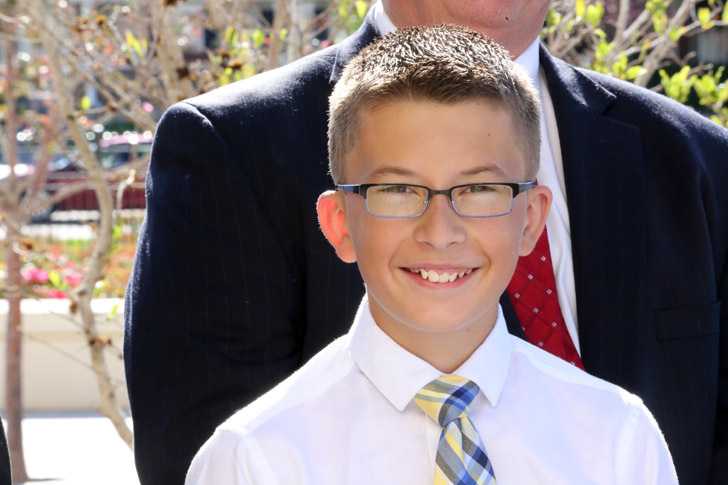 He and his father, Nelson, have matching ties for the day. 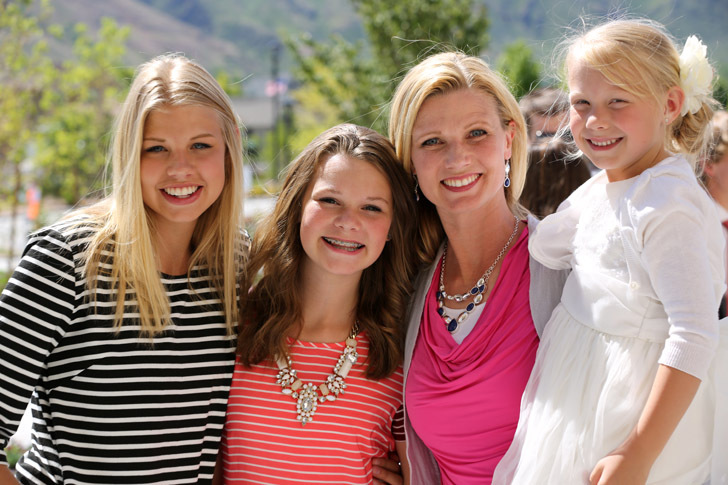 Tami Dietz with her beautiful daughters, Madi, 16; Emma, 13; and Sofi, 6. 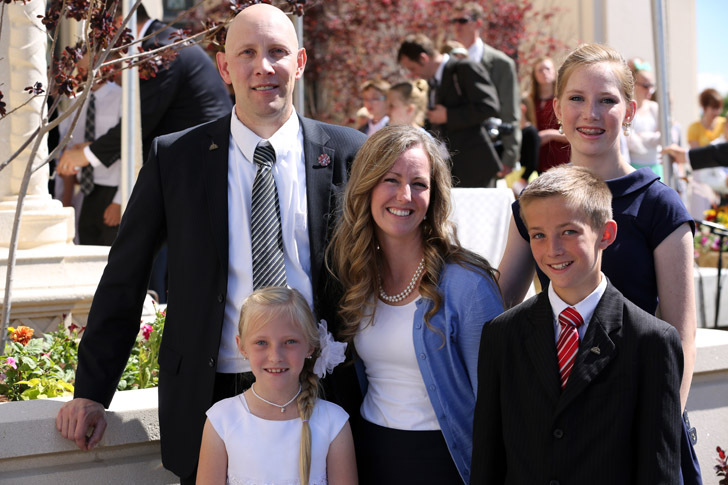 Their stake has been pushing family history to get ready for the temple, especially setting a goal for each youth to find a family name this year. Emma has already found a family name. 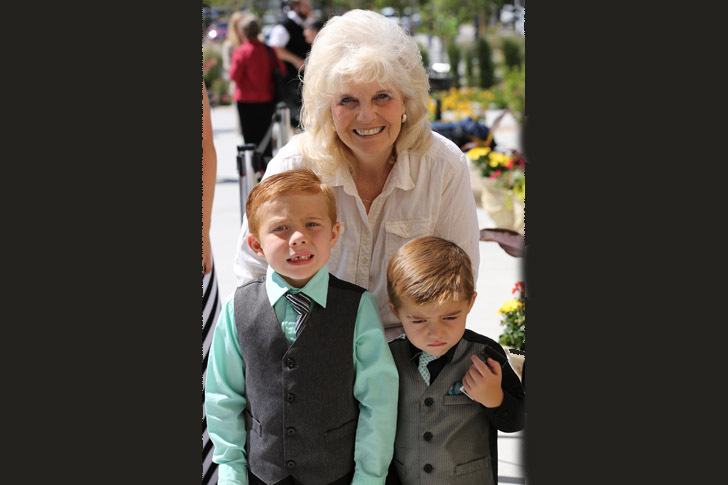 Cherryl Fowers brought her two grandchildren to the temple cover stone ceremony, Tyler, 5 and Kolten, 3. Their father, who is only 35 and is the foreman of a 400 acre orchard, just had a very complicated open-heart surgery. 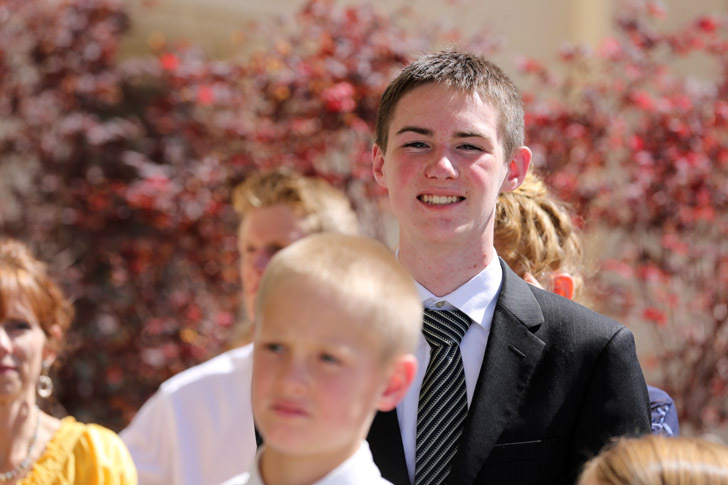 They all need the strength of priesthood blessings and the temple just now. Families gather after the dedication to remember this time together forever. 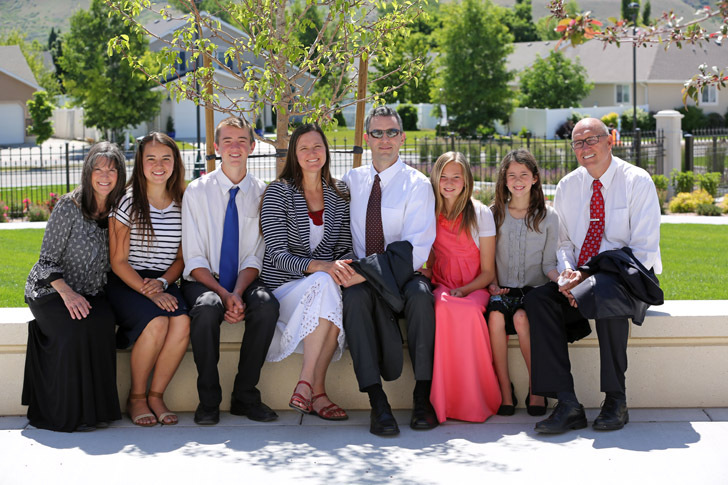 Thank you so much for taking the time to share the joy of this temple dedication. 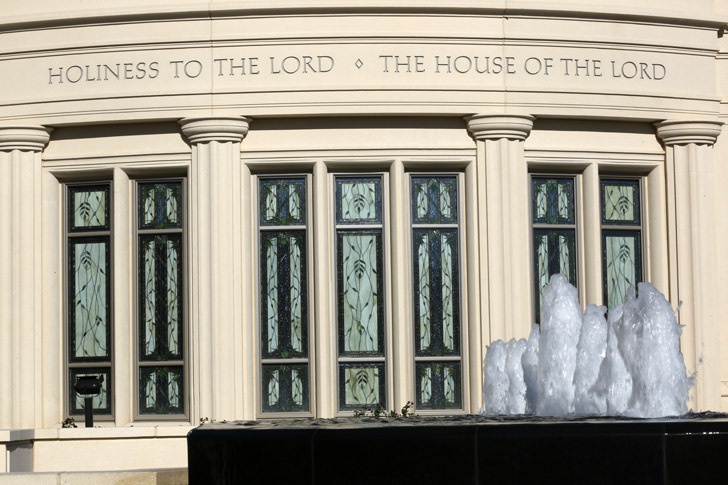 It looks like a magnificent edifice, truly a fitting House of the Lord. Thank you, Meridian Magazine. Your news and articles have caused me to ponder more on the principles of the Gospel. Thank you so much for posting these wonderful pictures with the insightful narrative. 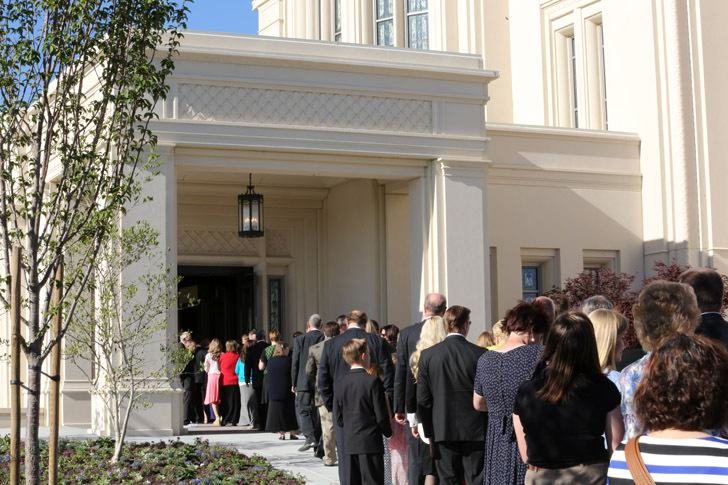 I have relatives in the Payson Temple district (some of whom were inside during the dedication), but I am not. Coupled with the open house, I now feel like I didn't miss out - after all - on the dedication. Thanks again.